Breakaway - Unique maison en pierre et en bois sur deux étages avec 25 acres de brousse et de jardins naturels. Avec cinq chambres à coucher et deux salles de bain, cette immense maison est idéale pour les vacances en famille ou les réunions de groupe jusqu’à 10 personnes. Cette maison est un pays classique - la faune abonde. Il est rustique et basique, mais propose de nombreuses fonctionnalités telles qu’une grande baignoire, des lits confortables avec draps fournis, une cuisine bien équipée, un salon en plein air avec barbecue, des télévisions satellite grand écran gratuites paddock arrosé disponible pour un cheval et bien plus encore. Il y a un escalier ouvert et un étang avec un pont pour que les enfants de moins de 5 ans et les personnes âgées soient mieux logés ailleurs. Visitez les vignobles, la ville de Margaret River et les plages populaires ou échappez-vous dans ce refuge paisible et profitez de la nature environnante, lisez un livre extrait de l'échange de livres et laissez les enfants jouer. NBN Wifi gratuit et Smart TV! old who had to be watched carefully. The lower bathroom was also dangerous. We repaired the upper bathroom sliding door which had come off its track before we arrived. 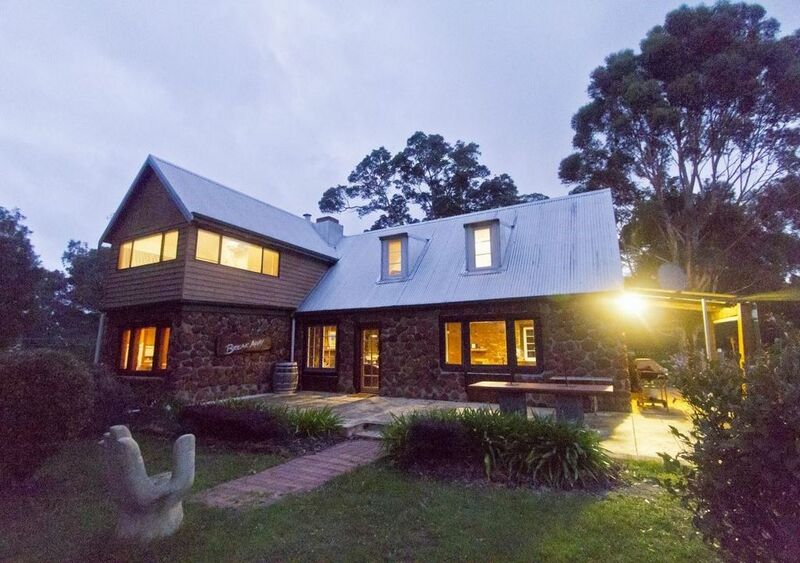 The property is central and we enjoyed our stay in Margaret River . Given the price we would not return. Thanks for the feedback Mary. We are sorry the house did not meet your needs and expectations. The stairs are not a problem for most people but then again, people who have mobility impaired people in their group usually book single storey dwellings to avoid issues that can arise from stairs. We can appreciate the difficulty the older gentleman would have had navigating them. We have a lot of families stay with young children and very few complaints. Having said that, if we had the opportunity to discuss the choice of house before you booked, we would have recommended a completely different style of accommodation to cover the diverse range of needs your particular group had. We have decided to make note on the property description to alert people to the fact some people may find the stairs or even the pond and bridge a hazard to young or old folks. Was it the tiled floor you found dangerous in the lower bathroom - we cant think what else it would be? Breakaway is a large, natural bush home and therefore vulnerable to bugs, pests, dust and cobwebs. Country properties tend to accumulate dust and insects faster than urban properties as there is alot more wildlife around them - it usually takes less than a day for the new spiders to replace the ones that were removed from the clean. There seems an endless supply of them in the country. If insects and spiders are an issue for guests we recommend, if asked, not booking a rural property such as Breakaway. As the outdoor furniture including the cushions live outside all year round they have weathered and the setting is due for an upgrade. The cushion covers are washed periodically but this doesnt always account for the dust stirred up and deposited in them over a very short period. The house was cleaned inside and out for 4 hours pre arrival. We try our best to keep on top of the presence of insects and bugs and cobwebs but it only takes a day or so and they return. The owner chooses not to chemically treat for spiders and insects because of the toxic cascading effects this has on the local ecology and they dont want to expose guests to such cancerous chemicals. I woukd like to take this opportunity to share my stay at breakaway farmstay in margaret river.the house is so big with nice fireplace.living room is so cosy.the kitchen is equipped with full facility for our usage.we really feel that we never gonna miss home cos we get to cook on our own .though we were there with family fren .i wil recommend this plc to my friends n family who is looking for farmstay vacations. My advise to people who wants to go there pls check in during daytime. Its much easier to find the road especially wickham road.the signage is abit too small u might just miss it .we truely enjoyed our stay here .thks to the host for putting up very nice home.